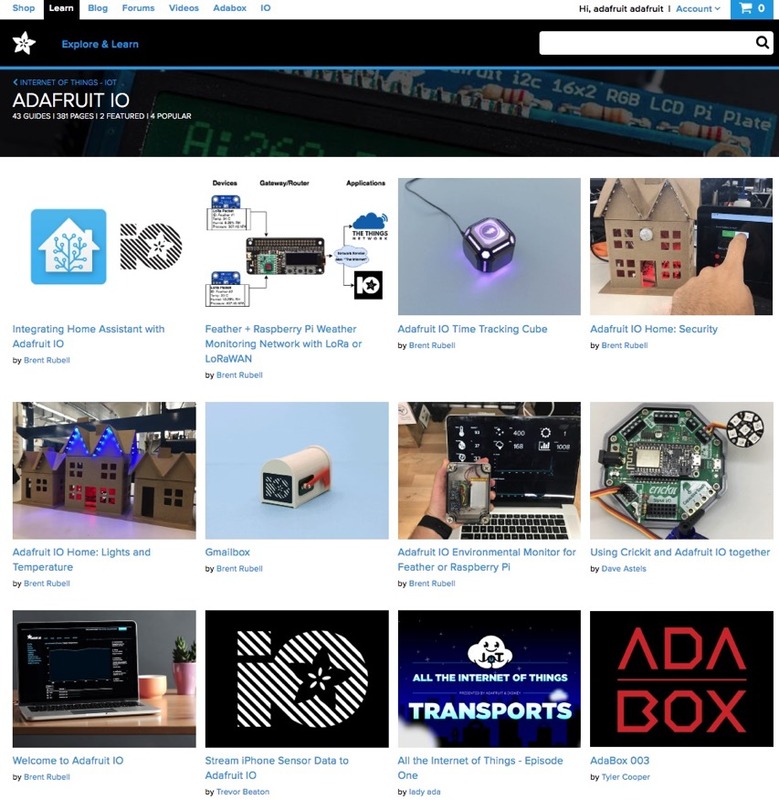 “I gave adafruit IO a try recently – super easy, just works, no fuss, super fast to get a device online, compatible with generic devices, open standards and protocols such as MQTT, working example code – nothing locked-in or proprietary.” – Luke. 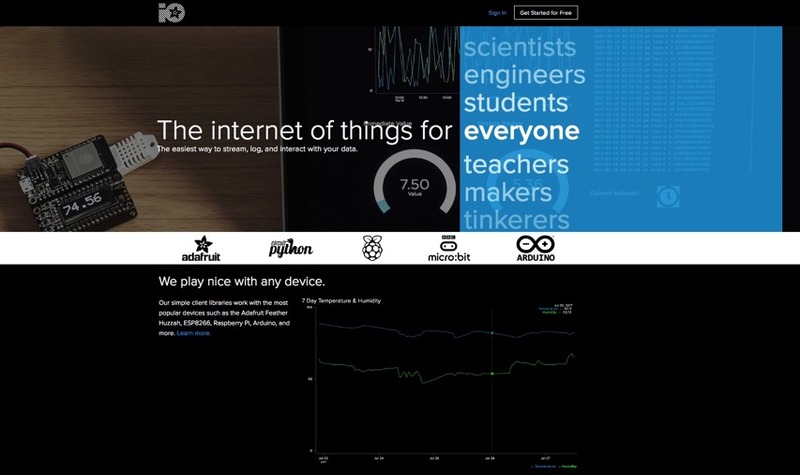 That’s why we made adafruit.io – We play nice with any device. The internet of things for everyone. 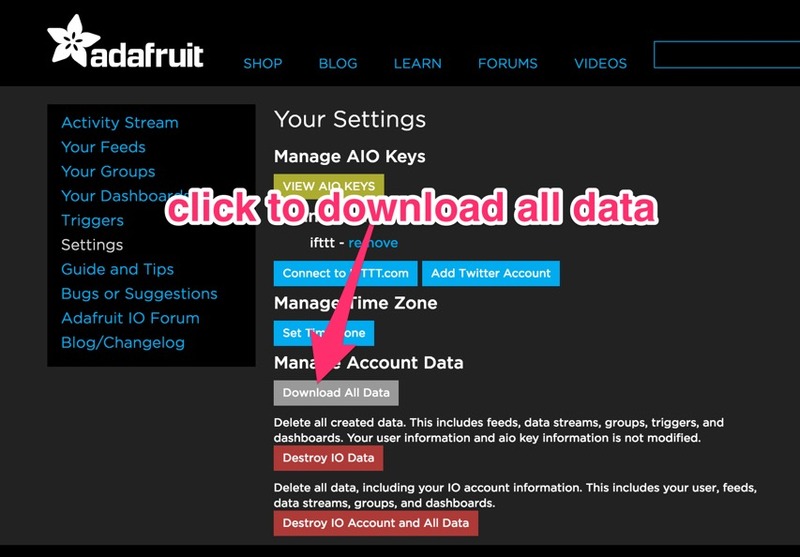 The easiest way to stream, log, and interact with your data. We have, and will always have, a free version which can be used by any hardware, and we have a plus version for folks who want to run a biz and more on it, also – any hardware. In the last 30 days there are 12,459 makers, hackers, artists, and engineers, making something on adafruit.io – try it out today! No spam, no mining your personal data, easy to read and understand terms of service/use, etc. 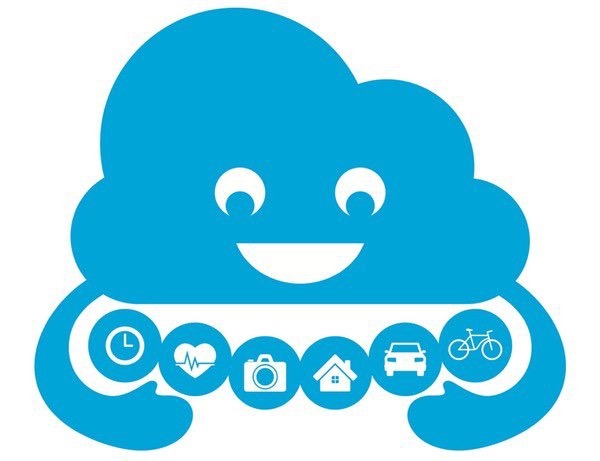 An Internet of Things Bill of Rights – Adafruit. Join us on Discord for the adafruit.io channel! Built from the ground up to be easy to use. We do the hard work so you can focus on the fun stuff. The same API that drives our user interface is available to you. We provide documentation so you can build a library in your favorite language to talk to IO, or use one of ours. The data you store with IO is yours to manage and control. You can download it all anytime and we will never sell or give it away to another company. We feel strongly enough about this that we put it in our IoT Bill of Rights. Data won’t help you make better decisions or understand the world you’re living in unless you can see it. Charts, graphs, gauges, logging, and more are availble from anywhere in our carefully designed web-based dashboards. 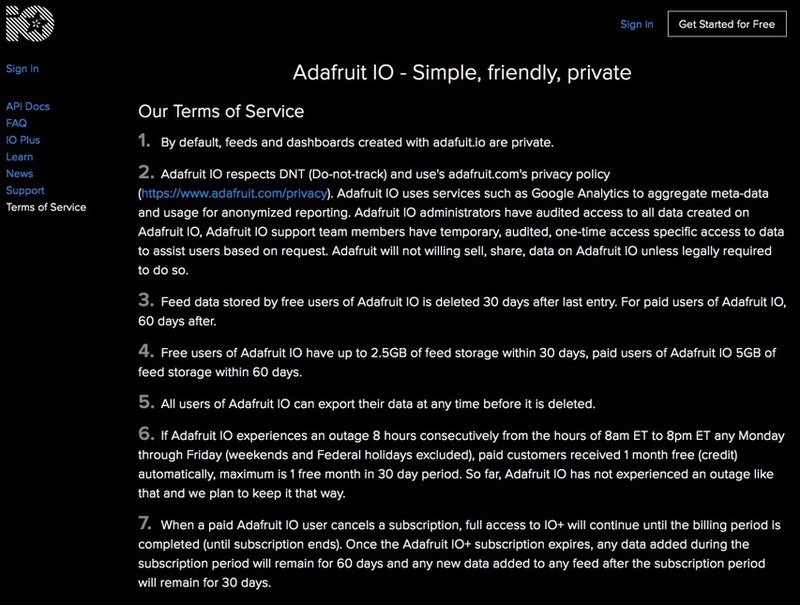 We won’t share your account information with anyone without your permission and everything you store on Adafruit IO is private by default, whether you’re a paying customer or not. 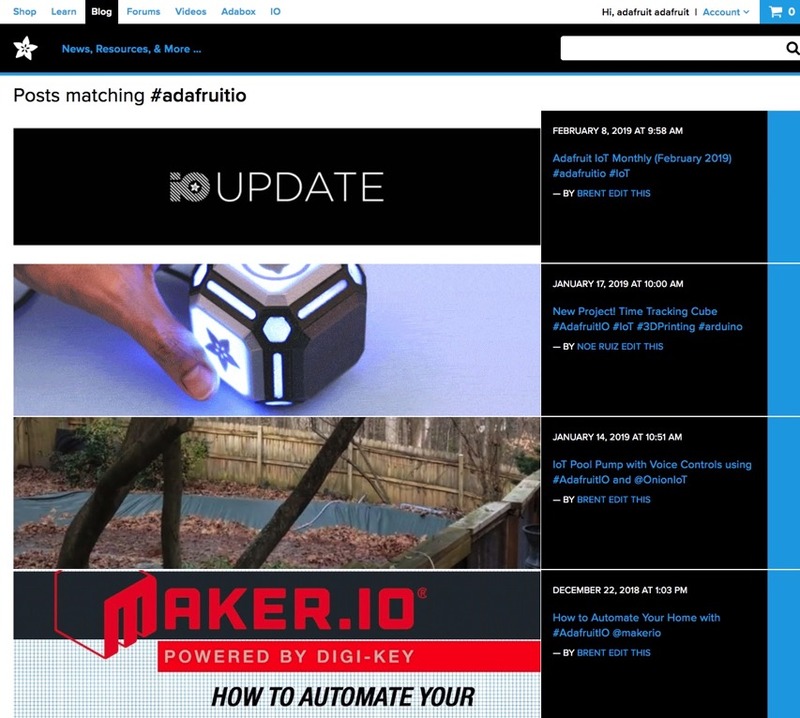 We’ve written a lot more about Adafruit IO than just our web API. Teaching is at the heart of Adafruit, and our Learning Systemhas all the projects and guides you need to get started or to level up! Keep yourself and your systems up to date by automatically responding to changes. Triggers monitor your data to notify you when your temperature sensor gets too hot or when your DIY security system goes offline. We have been building Internet of Things devices and kits since long before Adafruit IO ever existed. Start your project with the right equipment or pick up the one last thing you need to finish. We’ve got hardware for all types of makers. We Love Makers! Join us on the forums, on our Discord chat server, stop by the weekly Show and Tell live stream to share your project, and subscribe to our YouTube channel to see what we’re up to.